The silver-colored, durable nameplate labels L6008-20 of label size 25,4x10mm Avery are specifically designed for safe and professional property marking. 3780 matt coated polyester film labels on 20 sheets. The nameplates are extremely durable, oil, dirt, UV and temperature resistant (-40 ° to + 150 ° C), water and tear resistant. This makes them ideal for marking inventory and company property, especially IT equipment and electronic components. Create and print your nameplates quickly and easily – with the free Avery labels templates and software solutions under www.avery-zweckform.eu/print or the built-in Microsoft® Office package based templates. Suitable for all standard black / white laser printer. The silver-colored, durable nameplate labels L6009-20 of label size 45,7×21,2mm Avery are specifically designed for safe and professional property marking. 960 matt coated polyester film labels on 20 sheets. The nameplates are extremely durable, oil, dirt, UV and temperature resistant (-40 ° to + 150 ° C), water and tear resistant. This makes them ideal for marking inventory and company property, especially IT equipment and electronic components. Create and print your nameplates quickly and easily – with the free Avery labels templates and software solutions under www.avery-zweckform.eu/print or the built-in Microsoft® Office package based templates. Suitable for all standard black / white laser printer. The silver-colored, durable nameplate labels L6011-20 of label size 63,5×29,6mm Avery are specifically designed for safe and professional property marking. 540 matt coated polyester film labels on 20 sheets. The nameplates are extremely durable, oil, dirt, UV and temperature resistant (-40 ° to + 150 ° C), water and tear resistant. 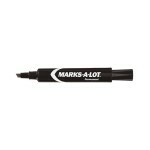 This makes them ideal for marking inventory and company property, especially IT equipment and electronic components. Create and print your nameplates quickly and easily – with the free Avery labels templates and software solutions under www.avery-zweckform.eu/print or the built-in Microsoft® Office package based templates. Suitable for all standard black / white laser printer. The silver-colored, durable nameplate labels L6012-20 of label size 96×50,8mm Avery are specifically designed for safe and professional property marking. 200 matt coated polyester film labels on 20 sheets. The nameplates are extremely durable, oil, dirt, UV and temperature resistant (-40 ° to + 150 ° C), water and tear resistant. This makes them ideal for marking inventory and company property, especially IT equipment and electronic components. Create and print your nameplates quickly and easily – with the free Avery labels templates and software solutions under www.avery-zweckform.eu/print or the built-in Microsoft® Office package based templates. Suitable for all standard black / white laser printer. The silver-colored, durable nameplate labels L6013-20 format 210x297mm Avery are specifically designed for safe and professional property marking. 20 matt coated polyester film labels on 20 sheets. The nameplates are extremely durable, oil, dirt, UV and temperature resistant (-40 ° to + 150 ° C), water and tear resistant. This makes them ideal for marking inventory and company property, especially IT equipment and electronic components. Create and print your nameplates quickly and easily – with the free Avery labels templates and software solutions under www.avery-zweckform.eu/print or the built-in Microsoft® Office package based templates. Suitable for all standard black / white laser printer. The weatherproof, white Shipping Labels L7992-25 for laser printers in the format 99,1x57mm Avery are for example: for addressing large B4 / C4 envelopes. 250 Return Address Labels 25 sheets. This hard-wearing, matt coated package labels from polyester film hold rougher conditions stood, are water- and tear-resistant, stain-resistant and UV and temperature resistant (-20 ° to + 80 °). You can rely on an absolutely jam-free printer throughput without glue deposits on the printer. Create and print your shipping label quickly and easily – with the free Avery labels templates and software solutions under www.avery-zweckform.eu/print or the built-in Microsoft® Office package based templates. Thanks INTERNETMARKE You can also print postage directly onto the shipping labels. Suitable for all standard laser printers. 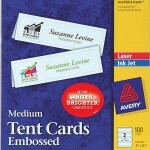 The weatherproof, white Shipping Labels L7993-25 for laser printers in the format 99,1×67,7mm Avery are for example: for addressing large B4 / C4 envelopes. 200 Return Address Labels 25 sheets. This hard-wearing, matt coated package labels from polyester film hold rougher conditions stood, are water- and tear-resistant, stain-resistant and UV and temperature resistant (-20 ° to + 80 °). You can rely on an absolutely jam-free printer throughput without glue deposits on the printer. Create and print your shipping label quickly and easily – with the free Avery labels templates and software solutions under www.avery-zweckform.eu/print or the built-in Microsoft® Office package based templates. Thanks INTERNETMARKE You can also print postage directly onto the shipping labels. Suitable for all standard laser printers. The weatherproof, white Shipping Labels L7994-25 for laser printers in the format 99,1x139mm Avery are for example: for addressing parcels and packages. 100 Return Address Labels 25 sheets. This hard-wearing, matt coated package labels from polyester film hold rougher conditions stood, are water- and tear-resistant, stain-resistant and UV and temperature resistant (-20 ° to + 80 °). You can rely on an absolutely jam-free printer throughput without glue deposits on the printer. Create and print your shipping label quickly and easily – with the free Avery labels templates and software solutions under www.avery-zweckform.eu/print or the built-in Microsoft® Office package based templates. Thanks INTERNETMARKE You can also print postage directly onto the shipping labels. Suitable for all standard laser printers. 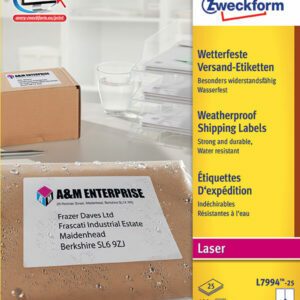 The weatherproof, white Shipping Labels L7996-25 for laser printers in the format 199,6×143,5mm Avery suitable, for example for addressing parcels and packages. 50 Address Labels 25 sheets. This hard-wearing, matt coated package labels from polyester film hold rougher conditions stood, are water- and tear-resistant, stain-resistant and UV and temperature resistant (-20 ° to + 80 °). You can rely on an absolutely jam-free printer throughput without glue deposits on the printer. Create and print your shipping label quickly and easily – with the free Avery labels templates and software solutions under www.avery-zweckform.eu/print or the built-in Microsoft® Office package based templates. Suitable for all standard laser printers. 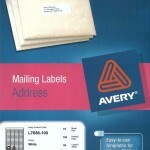 The weatherproof, white Shipping Labels L7997-25 for laser printers in the format 199,6×289,1mm Avery suitable, for example for addressing parcels and packages. 25 Address Labels 25 sheets. This hard-wearing, matt coated package labels from polyester film hold rougher conditions stood, are water- and tear-resistant, stain-resistant and UV and temperature resistant (-20 ° to + 80 °). You can rely on an absolutely jam-free printer throughput without glue deposits on the printer. Create and print your shipping label quickly and easily – with the free Avery labels templates and software solutions under www.avery-zweckform.eu/print or the built-in Microsoft® Office package based templates. Suitable for all standard laser printers. 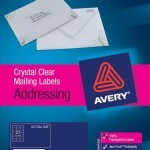 The white, weatherproof labels L4715-20 of label size 99,1×67,7mm for laser printers from Avery are characterized by an extreme durability for indoor and outdoor use. 160 matt coated polyester film labels on 20 sheets. Due to the strong, permanent adhesion own them particularly suitable for casual and loose marking. The tear- and water-resistant film labels are much more durable than paper labels, oil, dirt, UV and temperature resistant (-20 ° to + 80 ° C). 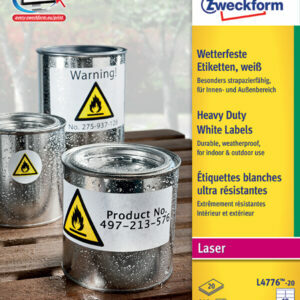 Create and print your weatherproof sticker quickly and easily – with the free Avery labels templates and software solutions under www.avery-zweckform.eu/print or the built-in Microsoft® Office package based templates. Suitable for all standard laser printers. The white, weatherproof labels L4716-20 in round format Ø30mm for laser printers from Avery are characterized by an extreme durability for indoor and outdoor use. 960 matt coated polyester film labels on 20 sheets. Due to the strong, permanent adhesion own them particularly suitable for casual and loose marking. The tear- and water-resistant film labels are much more durable than paper labels, oil, dirt, UV and temperature resistant (-20 ° to + 80 ° C). Create and print your weatherproof sticker quickly and easily – with the free Avery labels templates and software solutions under www.avery-zweckform.eu/print or the built-in Microsoft® Office package based templates. Suitable for all standard laser printers. The white, weatherproof labels L4773-20 of label size 63,5×33,9mm for laser printers from Avery are characterized by an extreme durability for indoor and outdoor use. 480 matt coated polyester film labels on 20 sheets. Due to the strong, permanent adhesion own them particularly suitable for casual and loose marking. The tear- and water-resistant film labels are much more durable than paper labels, oil, dirt, UV and temperature resistant (-20 ° to + 80 ° C). 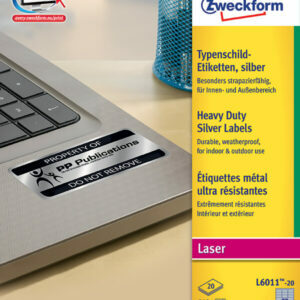 Create and print your weatherproof sticker quickly and easily – with the free Avery labels templates and software solutions under www.avery-zweckform.eu/print or the built-in Microsoft® Office package based templates. Suitable for all standard laser printers. The white, weatherproof labels L4774-20 of label size 99,1x139mm for laser printers from Avery are characterized by an extreme durability for indoor and outdoor use. 80 matt coated polyester film labels on 20 sheets. Due to the strong, permanent adhesion own them particularly suitable for casual and loose marking. The tear- and water-resistant film labels are much more durable than paper labels, oil, dirt, UV and temperature resistant (-20 ° to + 80 ° C). Create and print your waterproof sticker quickly and easily – with the free Avery labels templates and software solutions under www.avery-zweckform.eu/print or the built-in Microsoft® Office package based templates. Suitable for all standard laser printers. 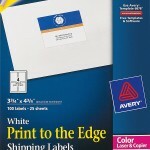 The white, weatherproof labels L4775-20 format 210x297mm for laser printers from Avery are characterized by an extreme durability for indoor and outdoor use. 20 matt coated polyester film labels on 20 sheets. Due to the strong, permanent adhesion own them particularly suitable for casual and loose marking. The tear- and water-resistant film labels are much more durable than paper labels, oil, dirt, UV and temperature resistant (-20 ° to + 80 ° C). Create and print your weatherproof sticker quickly and easily – with the free Avery labels templates and software solutions under www.avery-zweckform.eu/print or the built-in Microsoft® Office package based templates. Suitable for all standard laser printers. The white, weatherproof labels L4776-20 of label size 99,1×42,3mm for laser printers from Avery are characterized by an extreme durability for indoor and outdoor use. 240 matt coated polyester film labels on 20 sheets. Due to the strong, permanent adhesion own them particularly suitable for casual and loose marking. The tear- and water-resistant film labels are much more durable than paper labels, oil, dirt, UV and temperature resistant (-20 ° to + 80 ° C). Create and print your weatherproof sticker quickly and easily – with the free Avery labels templates and software solutions under www.avery-zweckform.eu/print or the built-in Microsoft® Office package based templates. Suitable for all standard laser printers.